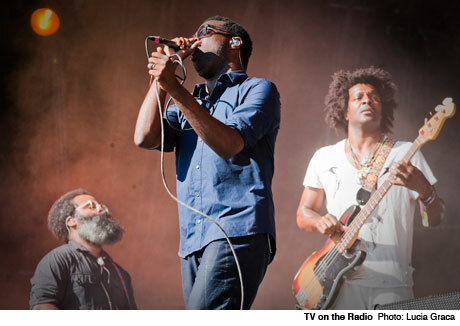 In 2011, TV on the Radio dropped their album Nine Types of Light and, scarcely a week after its release, lost bassist Gerard Smith to cancer. Now, the four-piece are rebounding from this sad time by switching labels and working on a new album. The band's last few records have come out through Interscope, but singer Tunde Adebimpe told Spin that they have now split from the label. He said, "Ehhhh...we parted ways with them. To the best of my knowledge, they can ask about another record, but I don't think we're gonna do that. Um, yeah they did what they did. [Laughs] That's as diplomatic as I can put that." Instead, TV on the Radio will be working with "Dave's label," which we assume refers to band member Dave Sitek's recently launched Federal Prism imprint. It's not clear, however, exactly when the band will release their next album. "We're sort of collecting material for a record, but right now we're only thinking in terms of songs, smaller things we can put out regularly until an album seems possible," Adebimpe said. Meanwhile, Adebimpe is planning to release an EP with his side-project Higgins Waterproof Black Magic Band (featuring Ryan Sawyer, Josh Werner and Alex Holden). He explained, "We started doing mostly improvised shows but you do that a few times and songs start coming out of it. It started off pretty noisy and there's still a little bit of that element. It gets tripped out in places. If you like Can or This Heat, you'll probably be into it. We recorded five songs that I'm mixing right now. We'll put them out summer or early fall." Hear some live material from Higgins Waterproof Black Magic Band below, and stay tuned for further updates from the TV on the Radio camp.